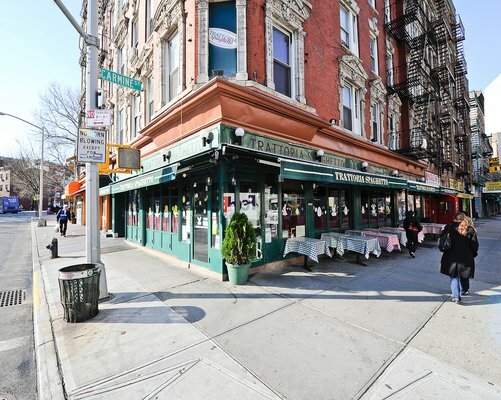 At the corner of Carmine and Bleecker, Trattoria Spaghetto has kept the same traditional Italian recipes for over 30 years. But you’d never know it. Under that green awning, seated at a table just big enough for one, my boyfriend and I shared a plate of linguine al pesto. Bold, fresh, and satisfying, the pasta was nothing like we had ever tasted before. We had planned on looking through apartment listings on our phones while we ate but all we could think about was the food. It was just so good. The pesto was the colour of a kale pineapple smoothie; a green so bright it made you feel hungrier just looking at it. The texture of the linguine was velvety and rich and made me wish I had grown up with it instead of steamed jasmine rice. From our spot on the sidewalk patio, the West Village neighbourhood seemed to wrap around us. A park on one side, a row of eateries on the other, taxis cruising by just two metres away, and crowds of people everywhere. But we had eyes for none of it as we mopped up the last of the pesto sauce with slices of warm bread. We were just a couple of kids in New York at an old Italian restaurant. Somehow with barely any sleep or conversation between us, just good food and good wine, it became a moment we’ll never forget. That was three years ago. Since then, I’ve tried everything on the menu, twice. Like a good friend who’s always there for you no matter how much time has passed, Trattoria Spaghetto is a place of comfort. Every night is like an open house hosted by the neighbourhood’s oldest resident with a laissez-faire attitude. Sit wherever you like. Eat as much bread as you want. Laugh as loudly as you can. Just come and enjoy yourself. I recommend starting with the minestrone or if you’re hungry, the mozzarella classica as well. The soup is one of their most popular items on the menu and for good reason. It’s made with vegetables that are in season and just enough olive oil to produce a hearty flavour. The balance between the ditalini and vegetables is just right, every spoonful is a medley rather than luck-of-the-draw, making the experience wonderful and comforting. There’s no one ingredient that dominates the bowl and the carrots, zucchini, potatoes, beans, and celery are soft but still firm enough to present something to enjoy before swallowing. If you want to eat what the Italian and Portuguese workers ate when they lived in the area and Trattoria Spaghetto was Bleecker Luncheonette, try the calamari marinara. The peppery, even, and well-seasoned tomato and garlic sauce tastes exactly how you think it would, given the context that it’s a recipe that’s been perfected over three decades. It’s not too thick or thin and the generous seasoning compliments the squid well. It doesn’t really taste like any other marinara sauce, perhaps because of the lack of herbs, but it does taste delicious. As if the tomatoes were freshly picked off the vines not too long ago. Be sure to order it with a side of broccoli to really enjoy the zesty flavours. In some ways, eating at Trattoria Spaghetto is like attending a Gatsby party, albeit without the fancy dress code and mandatory dancing. There are no rules to the dining experience and you’ll find yourself amongst a diverse group of guests, as if anyone and everyone from the West Village goes there for dinner. This, along with the dim lighting and well-used tables, makes for a relaxed and familiar atmosphere. You’ll hear friends talk of other friends getting married, the day’s office drama, and sales at Bloomingdales. You won’t find any pretense or awkward blind dates. Nor will you ever see someone wondering where the bathrooms are located. Every time I go, I get the feeling everyone else has the same intention I do, to eat good food, sit with good people, and comfortably enjoy good conversation.